Mine Kill State Park Near Albany - a Swimming & Fishing Paradise! Named after the spectacular Mine Kill Falls, Mine Kill State Park is about 40 miles southwest of Albany and is definitely worth a visit. Love to fish? 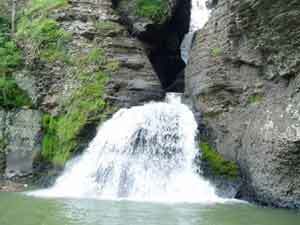 Situated in the scenic Schoharie Valley, this park has an abundance of opportunities for great fishing. Trout, pan fish, bass, carp and walleye can all be found within the lower reservoir. Like to swim? Dive into the Olympic-sized swimming pool at Mine Kill's aquatics facility. Love sports? Mine Kill also houses regulation sized athletic fields for your enjoyment! *Bow hunting for deer allowed in fall with permit only. Call the New York Power Authority Visitor Center at 914. 287.4271.